There is a very high risk that these illegal copies will open or otherwise fail at verylow loads under normal use. These illegal copies do not meet the requirements of CE or UIAA standards. These illegal copies look exactly like the Petzl originals. Their outward appearance has been expertly reproduced which makes them very difficult to identify. All markings on the packagingOnly an in-depth analysis allows us to identify these illegal copies. To date, only a few counterfeits have been found on the market and we are actively working to stop the production and the introduction to the market of these dangerous products, which put our clients’ lives at risk. With regard to the risks involved in using these illegal copies, our duty is to inform our customers. By the middle of February, we are going to post a user warning on our Website. 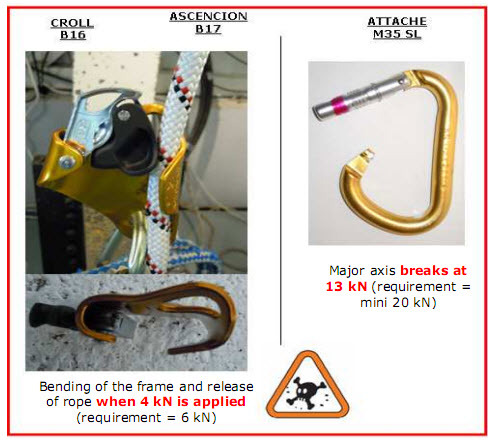 Avoid any other source, and if you have any doubts on the authenticity of Petzl products, please contact us. We remind you that selling PPE (personal protective Equipment) may hold the seller liable. Your vigilance and your professionalism together with our action plan will allow us to cut offthis source before it becomes too extensive and floods our markets with illegal copies, which puts our clients’ lives at risk.